[04:25] – Where did the term ‘millennial’ originate? [16:20] – What is motivating Gen Z to change the world? [27:00] – Will there be absolute truths in the future? It’s a seamless integration between online and offline. I believe the human factor will limit what we want robots to do in our lives. We’ve substituted the depth of connection for the breadth of access. Claire Madden:	When we look at these younger generations they've been shaped where they've had a voice from a very young age. Their idea of an encyclopedia is one they themselves change and contribute to. So it's something that is, they've had a voice, it's not just something that's written by the experts and they just consume. You are about to experience a next [inaudible 00:00:32]. Scientists, entrepreneurs, thought leaders. You're listening to the future of [inaudible 00:00:44] podcast. Cal Taylor:	Hello and welcome to the show. I am your host, Cal Taylor and you are listening to in my opinion the best show around but maybe I am biased. This is a show where you get to listen in as I interview scientists, entrepreneurs and thought leaders all about what we are facing as we continue our march towards the future of humanity. In today's episode, we are talking all about generations. So I am a generation Y. You maybe a generation X or maybe a baby boomer or even better, you yourself may be a generation Z or Zed, however you like to say it. That is exactly who this episode is all about. 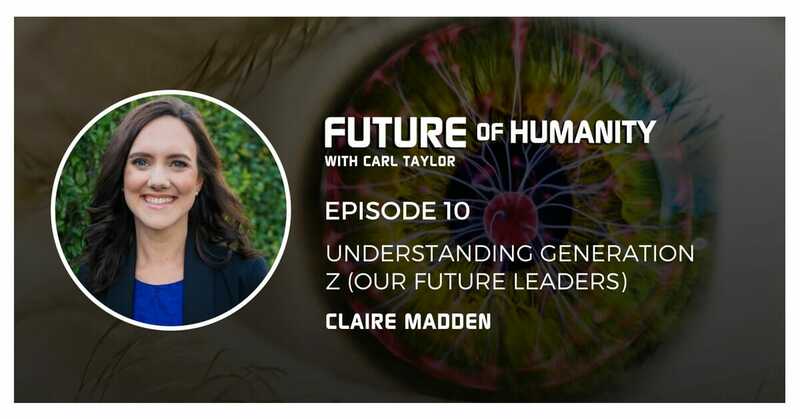 We are joined by Claire Madden who is a leading voice, internationally on generation Z. She is an author, social researcher, keynote speaker and media commentator. She generously took some time out of her very busy schedule to join us on this episode to talk all about generation Z and her new book, Hello Gen Z. Engaging the generation of post-millennials. In this episode, we discuss some of the language that Gen Z are using. We talk about social media and its impact on this new generation. We talk about what gen Z is looking for from employers, what type of leaders that they're likely to become and much, much more. If you're a parent of a gen Z you'll definitely want to stay listening. If you're an employer or manager trying to understand this new generation of workers, or you're an entrepreneur and marketer needing to better understand who you're marketing to, this is an episode you will not want to miss. And of course, if you yourself are a generation Z, please stay tuned. I'd love to get your feedback after this episode. So please welcome Claire Madden. So welcome Claire. I'm so excited to have you. Your book is absolutely fascinating. It's Hello Gen Z. Engaging the Generation Of Post-Millennials. The biggest question that I have on my mind is, I believe I'm a gen Y but then I feel like sometimes I'm referred to as millennials. Can you clarify for me the difference between a gen Y and a millennial? Is there a difference? Are we the same? What's the go there? Cal Taylor:	Wow, okay. So that's interesting. So there's actually not agreement on the exact years or bracket of a generation. Claire Madden:	Exactly. That's right, yeah so there's a lot of different researchers and theorists and there's general sort of years but it's never runs out by a few years so it's one of those funny things and then it just adds even more confusion when we start giving them different names like gen Y and millennials and everything so I think you're the first person to wonder where you fit, Cal. Cal Taylor:	Well yeah, when I think about the years you just mentioned like 1980 to 1994, that to me, when I think of millennial, I think year 2000 so where did the word millennial come from? Claire Madden:	Yeah that's because the millennials had the turn of the millennium in their formative years so Y2K and everything that went with that, that generation grew up with that being quite a significant moment. Other people do say it's up to the year 2000 but there's an argument that for the fact that so much is changing so quickly now that if we spread a generation over 20 years that is quite extraordinary amount of time and change when we're trying to look at distinctive of our particular cohort or groups so going with the sort of 15 year age group gives a perhaps more measurable, containable sort of age group. Cal Taylor:	Yeah, that's interesting that it's now more looking at 15 years and as you say, like technology is rapidly changing, so fast that it's got to be having an impact on the generations. So we're not here to talk about gen Y though, although that definitely comes into it. Your whole book is all about gen Z or really it's about intergenerational change. It's not just gen Z but it's very focused on that. So I'm [inaudible 00:05:24] to know how do you define gen Z? Claire Madden:	Talk about gen Z's as those born between 1995 and 2009 so there are school kids entering [inaudible 00:05:37] education, they're also entering the workforce at the moment and they have had their formative years influenced as such extraordinary exposure to technology at such a young age and that's being a marker of them. When I ask them to define what shape their generation, the two responses I heard time and time again were technology and social media. And to the extent to which social media is part of the way that they live is really quite extraordinary. Cal Taylor:	Yeah and I think one of the things you mention in the book is that they grew up with wifi like they just been always connected, they really haven't known anything but connection and they didn't have dial up, they kind of just always had fast loading ... I think one the things you said is like the oldest gen Z was born when Ebay was launched or something like that. That just seems crazy to me but to put it in context. Cal Taylor:	So the fact that they've always been so connected, what has that done or shaped? In the book you interviewed over 100 different people to get their insights. What did you find was the biggest thing that is shifting in the gen Z's because of this hyper connectivity. Claire Madden:	There's a number of factors. One is that they are a deeply social generation and they feel the need to be constantly connected to the networks and to be able to update their friends and networks instantaneously as something unfolds. None of this wait 'til the next morning, go to school, then tell your friends what happened last night. It's as it's unfolding, you instantly, your reaction is to inform the people in your world. There's a number of implications and impacts of this. I mean one of the things they talked to me about was how they've got a really short attention span. They find it hard to focus on one thing and everything kinda catches their attention and distracts them. Another interesting thing is whilst they're spending an average of 2.7 hours a day connected to social media. Some of them talked to me about the concern they have for their generation that they're losing the ability to interact socially in terms of, a guy Mac born in 2000 said, "We're losing the ability to have a conversation face to face." So so much of their world operates mediated through a screen and it's created incredible efficiencies and life is so convenient now with so many functions and apps from a smart device we carry with us everywhere we go but it's also got flip sides of some of the other impacts it's been having. Cal Taylor:	The impact of not have a conversation, one of the things that I learned reading your book which absolutely fascinated me and I've been telling everyone about it who's Gen Y is this idea of well what we can do in a face to face conversation 'cause that's how we grew up communicating. We knew about the different nuances that in a text or email you couldn't really get across your emotion. It was emotionless yet they have created text speak, SMS speak to be able to send that emotion. Like I think one of the things you mentioned in the book is that a full stop or period for our American listeners that on the end of an SMS is I'm angry. Claire Madden:	That's exactly right. Cal Taylor:	That blew my mind. I'm like, wow, how many Gen Z's am I speaking to who think I'm angry at them? Claire Madden:	I know, this is what Brooke said, born in the year 2000. She said, "If you're mad, you finish your sentences off with a dot. People who say why you mad? You normally don't use full stops to end your text. You use extra letters on the end of the word or you use an emoji. I taught mum because everything she did a dot at the end, I thought she was mad. It's blunt, it cuts off." So a number of kids talked to me about this, about how full stops or periods are about, it's rude, it's blunt, it cuts off, it's saying, I don't want to reply because I dotted you. It is amazing the number of things that come up with though to make up for the what's lost by not having face to face where you've got all the nonverbal cues. They are making up for it with the [inaudible 00:09:35] effort in how they write what emojis they use. They talk to me about we've got fast funds now and so surely we can go to the extra effort of adding a few extra letters to the end of the word or adding an emoji and so that all expresses their mood and their attitude not just the actual words used is fascinating. Cal Taylor:	Yeah like the other one list that you'll find fascinating is that OK just O and K is also kind of short and mad or just a K is short and mad whereas my generation that was kind of just smart to just type K.
Claire Madden:	That's it, OK just the O and K is not the same as O-K-A-Y and then a smiley face. One is short and blunt and rude and then the other one is more open and friendly so they are reading. There's a lot of subtleties, there's a lot of layers to that how they communicate. And they've also made up a whole language of words they use to go with it. It's pretty amazing. Cal Taylor:	I mean we think about this shift even just in the way they're communicating. As an entrepreneur myself and running a business and many listeners also entrepreneurs or aspiring entrepreneurs, how is it different for us marketing and selling to, we'll talk about workforce and employing them in a minute but more importantly, if they're our market and they're our buyers, how is it different in how we need to be communicating to them? Claire Madden:	Well they have been exposed to a lot of advertising and marketing and they're quite savvy consumers so they don't like just being, things being pushed on them like when organizations are trying to be cool and using Instagram or something that actually just blatantly trying to push or sell. They recognize that. They much prefer it when you engage them as a human, as a person. Get their subcultures and get their kind of language and be authentic as well so don't just try and be what you're not be. Be authentic, know who you are but include them in the conversation and what you find is you get Gen Z's who genuinely promote your brand, genuinely like your brand. They're part of it, they engage with you and so I think they're looking for more than just being sold to. Cal Taylor:	Wow, you say that as a Gen Z thing but I feel like that's just a human thing in general. Surely, everyone doesn't really want to be sold to and they want to be connected to or maybe it's just the Gen Z's are smart enough to have figured out that they can demand it. Cal Taylor:	Let's talk about employment then. I mean, what are these guys like in the workforce? They starting, the oldest Gen Z's would be in the workforce or potentially entering it. What are they like in terms of if I was to I want to employ them or I have them in my organization. What's the differences we're seeing in this generation? Claire Madden:	Yeah well when I asked them I said, "What do you think work will be like and what will matter to you in your career?" A response I heard time and time again was, "Claire, I don't know what I'm going to do or I don't mind what I do as long as it's something I enjoy." Enjoyment was such a high priority and motivator for our Gen Z's when it came to thinking about their careers. That's by no means a bad aspiration, it's probably just a different starting point from where older generations were starting their careers. They were probably looking for things like survival and security needs if we think about Maslow's hierarchy. Thinking about, will this be a secure job? Will I have it, be able to provide for my family here? Those sorts of things whereas for Gen Z's their starting point I'm finding is a different one. They also talked to me about, I want to make a difference in the world and many expressed, you know, we've been given a lot. We've been handed a lot on a silver platter. Yet, they're also so globally connected and globally aware that, what do we do about all this? How do we actually change this world that we know it needs changing? They see their careers as a significant way to make a difference in the world. Different motivators, they're not bad motivators but they certainly different starting point and you also see that they care about the culture of the workplace. They care about belonging and the social side of it and belonging like they're known and their leaders are relatable, their bosses are relatable, co-workers and things like that, not sort of distant, lonely workplaces. Cal Taylor:	We actually talked about this recently. We had Fiona Endson come on and talking a bit about the future of the workplace and how work, the nature of work is changing and we talked a lot about how the kind of the culture of what employees are looking for is a more collaborative leader. Someone who I mentioned that in my own business I never tell my team members that I have all the answers. I encourage them to debate with me and challenge me on my ideas and apparently, that's the big trend and so would you say that Gen Z is the same, that's what they're looking for from their leaders? Claire Madden:	Yeah, absolutely. When you think about traditional leadership styles there are more hierarchical, positional authoritarian, sort of top down approach and that worked in a lot of context and was what context or time required but when we look at these younger generations, they've been shaped where they have a voice from a very young age. Their idea of an encyclopedia is one they themselves change and contribute to. So it's something that is, they've had a voice. It's not just something that's written by the experts and they just consume. They are content creators and collaborators from a very young age. Furthermore when it comes to social media they have a voice, they have their own sites where like You Tube where they create the content and so when we bring the into the workplace and we say, here's your tasks, this is what needs to be done and off you go and do it. That is very foreign environment for them. It is quickly disengaging and it is unusual for them because they're like, you don't want me to be part of this? You don't want me to create ideas or come up with things or be part of this. So collaborative leadership is really powerful. It's not about oh my goodness they need to be the CEO by tomorrow. But it is about placing value on every person in the team whether they've been there for one day or 10 years. Whether they're younger or older and saying, hey, let's get you engaged here. Not just in the hours that you turn up but let's get your heart engaged. Let's get your passion engaged. Let's get your mind, your ideas and you get so much more out of the team when you move to a model like that. Cal Taylor:	One of the things that came to mind before when you were talking about how they've been creators and so socially connected and one of the things I wonder about is often it's referred to the younger generation is becoming so narcissistic. You mentioned also they want to change the world and one of my thoughts on that was, what's their motivation to change the world? Is it because they're looking for personal significance or is there a deeper, greater sense for changing the world? What are we seeing when someone goes as an older generation we look at it and go, oh they're being narcissistic. They wouldn't say that. As a social researcher, what's your perspectives on that? Claire Madden:	I think it's probably a bit of both. I think every human wants to feel like they can contribute and that their life can have an impact and they can leave a legacy. I think it's deep within the human heart to want to do that but I don't believe that we have a motivational that these Gen Z's have a motivation just for the self-fulfillment. I really hearing them that they do have a care for this world and for people and for being able to see things improve and they often just need the context, a way to be able to do that so because partly their life stage now and I was interviewing them, you know that a lot of them are teenagers, they're saying, when all these people ask us to help or charities or there's world crisis that we watch unfold minute by minute on our phones, we don't really know what to do because we don't necessarily have cash we can just throw at it and one girl said to me as a world crisis was unfolding it was so sad that she didn't know what to do so she just sat there pressing the crying emoji on Facebook as a way of saying, this is really sad. I want this to be better but sometimes they need an avenue or a context to be able to do something and that comes with time and it comes with and hopefully a workplace can give them that, yeah. Cal Taylor:	Absolutely okay yeah that's good to know. I think it's very easy every generation I'm sure we all suffered. I know Gen Y we definitely did. We were classified as lazy and entitled. Gen X's and baby boomers, every generation before it 'cause we're different. Every generation is different and so it's easy to look at them and go, well that's so bad. They're so connected, they're so narcissistic, they're so whatever with social media. But the reality is it's their world that's what's true for them. One of the things that I did wonder about is because they are so connected, you mentioned they are not great at having a real world conversation. How else are they engaging in the offline world outside of conversations? Or is a lot of their world now just so digital? Everything's really digital. Claire Madden:	They are engaging the offline world as well. I think what we're finding is that it's the same [inaudible 00:18:52] integration between online and offline. A little bit like how we don't probably think about when we're using electricity or when we're not. We just use it. It's the same for this generation, Gen Z's with technology. It's not really oh, remember the days as a Gen Y I too am a Gen Y. Remember when we used to surf the web as like a hobby? You know or something you do that night? What do you do? I surfed the web as though it was going on the internet and using the internet. They don't say it like that, it's just part of life like breathing oxygen and just going by every day so I think there's fallacy of a distinction for them between when they're on and when they're off and there's this flow on so even conversations that might be happening in face to face going to be inspired by what's been shared online or the conversations that were happening online or and some of them said to me, we were at a café and we run out of things to say, we just get our phone and start scrolling social media, find some new things to talk about and then get going again. So it's sort of so integrated it's hard to separate. Cal Taylor:	I think that's an interesting point. It's very quick and easy for older generations for us to go, oh look at these kids, they're just there in the café, they're not talking to each other, they're there on their phone and then you've just mentioned that, well they might be there looking for something to then talk about offline and connect in an offline way once they found something. Claire Madden:	Yeah that's right. They still want to turn up to places and collaborate and be there in person with one another so they know that online has a role and a function but they also know it's not for feeling the everything. It certainly doesn't replace human relationships and what I found really interesting in the research was how a lot of young people mention to me that life was better before social media. It was better when we got to ride our bikes outside. Cal Taylor:	So they're conscious of that. They're actually, they're aware of it. Do they have a desire to change it or is it just the consciousness of awareness but not necessarily enough to drive them to change their behavior? Cal Taylor:	Surely that's got to be affecting mental health then. Cal Taylor:	I mean is we project forward and we think about with Gen Z's and then generation alpha I believe it was called is the generation after them. If we project forward and think well they're the leaders of tomorrow, 10, 20, 30 years from now like what do you think the world is gonna look like with the Gen Z's and the Gen Alphas far more integrated into our world of workforce and just starting to be in leadership roles? Claire Madden:	The world is constantly changing and if we even look from your builders generational otherwise known as traditionalists, the ones born before 1945. What they've seen, the technology and the change in work and everything in their lifetime has been, it's hard to comprehend. It's been extraordinary. So similarly we'll continue to see significant change. But as we're looking at people projecting and what's gonna happen with robots and artificial intelligence and machines getting smarter and all of that in the industrial revolution 4.0. What we're seeing is will this still going to be the human factor? In fact, perhaps more important than ever is interpersonal skills, the connections, the relationships that human side as perhaps more can be done with machines in some respects. Cal Taylor:	Do you think that the Gen Z's want that? Do you think when they think about the future, they want to see a world of mostly robotics or do you think they're gonna reject the idea? Because I think a lot of these things with the technology is capable and I mean we're a capable ... to be honest, we could have driverless cars on the road pretty well today is we just took all the human drivers off the road. So the technology to do a lot of things is there. It's whether the market will accept it and one of the things I wonder about is well, yes at some point maybe we won't accept it because of our generation and our values but over time the generation's changing, values change. Are they someone who because they're so embracing of technology even more so than our generation, they're welcoming of this robot future or are they a bit hesitant of it? Claire Madden:	I think that seeing machines and robots and all that for the efficiencies that they can enable and the new areas of work that they'll open up. I'd say the human factor will continue to let you say, limit what we want robots to actually do in their lives because I mean I spend my life traveling and going to speak at conferences. What amazes me is why did everyone turn up to this conference? Why didn't we just Skype in? Why didn't we just watch this on You Tube? It's because of the human ... because as [inaudible 00:25:05] us as humans is to connect person to person, it's to come together. Learning happens differently when we rub ideas off from one another and bounce things off and actually relate. It's that person to person level not mediated by a machine or a screen. Cal Taylor:	They're still gonna look for that, that human side. They're not gonna completely erase the robot overlords and a completely virtual VR world where we never talk to a human in real life. Claire Madden:	That's right 'cause that doesn't satisfy the date longings of the human soul and how we're made so and those companion robots that have been developed and heard of in Japan and things but honestly when we've got loneliness epidemic that loneliness increasing and all those things. I mean, I think what we might see is actually bit of a return to community and people and a real focus on that in the future because I think it's actually what we're starting to realize we [inaudible 00:26:45]. Cal Taylor:	To me that's a positive. I love tech, I'm very much a tech geek and I embrace the robotics but at the same time, I do worry about that impact and so to know that the Gen Z's are looking at that, that they are conscious and aware of because they're the next Zuckerberg's, the next Elon Musk, the next people who are gonna make massive disruption to their world and it's nice to know that they're gonna be considering the community side of things. One of the things that was really interesting actually in your book, I highlighted it was something that I definitely, I've definitely noticed that seems to be a trend in today's society and Neil Degrass Tyson actually talks about it, too. The quote was, "Gen Z's have been shaped by a world view that promotes that there is no absolute truth and that every opinion and preference is as valid as the next." I thought that's really interesting because there is in science at least there is a lot of sometimes denials of basic facts and so this is an interesting trend. What do you see or how do you see this showing up in kind of the Gen Z's lives? Cal Taylor:	Absolutely. I mean one example just to kind of give an example of this is like the flat earth is versus the globe. Yes, you can respect that someone chooses to believe that there is an element of that and I can appreciate that but at the same time, is that helping society to encourage and allow someone to believe something that we have proof, data backed up for photographs, GPS systems so much about the world that would not work if we weren't a globe if we didn't stand up to challenge that? I think that's the challenge of I'm very much a believer of well I can respect someone 'cause if I was in their shoes and if I had lived the life they've lived and read the books they've read and had the conversations they had, I would think exactly the same as them. I can respect that but I feel like it would be my responsibility to not let them just sit there believing something that is not a matter of opinion, there is a fact. I don't know I just wonder if that when I saw that comment, I thought, how is that gonna affect fake news and what's happening like if everyone just chooses to believe what they wanna believe and as you mentioned about the offense. People can be offended that you're offended. Cal Taylor:	How do you know what's true? Claire Madden:	Yeah, where do you take that piece of information and test it and go deeper and ask why and do that again and so it's the depth/breadth thing, the surface thing and I think that where it's just so, we're filling our lives just consuming so much surface stuff. For example, the 2.7 hours a day of social media or the seven hours and 40 minutes we spend consuming media content everyday and yet where is the space for like obviously people can express their opinions and ideas like never before but where is the rigorous discourse or the deeper thinking or where there's respectful debate in terms of okay, I really do wanna understand what you mean by that and not just reactions and all of that. I think we'd be in a better place in society to draw on some of that. Cal Taylor:	Yeah interesting what kind of mind there is like maybe the next social media needs to be a debate medium but then I could just imagine trolls will just come in and ruin it for everyone. Claire Madden:	Yeah that is a challenge with social media is the anonymity of it where you can just and people keyboard warriors who can just you know, get on there and have a rant but yeah, if we could create a listening culture somehow and perhaps we can try this through podcasts and mainstream medias, good journalism that can ask those deeper questions but so much is driven by well what will get the popular vote now or whatever rather than deeper thinking. Cal Taylor:	Yeah well if you're a Gen Z and you're listening to this, I'm so glad you're here and please make sure if you haven't subscribed and continue to follow along with these conversations because this could be ideas of what you could talk about with your fellow students and friends. Claire Madden:	Or if you're feeling salty Cal. Cal Taylor:	Or salty, yes. Claire Madden:	Or people have been throwing shade. Cal Taylor:	Oh I don't think I saw that one. What's throwing shade? Claire Madden:	If you're throwing shade, you're sort of bagging someone out, you're being slack and then if you're being a bit harsh than that's called savage. So someone, oh savage and then if people have been throwing shade maybe you'll feel salty which is you're upset or you're moody or you're a bit mad so absolutely entertaining what a classic generation they are. I tell you they are very funny, very creative. Cal Taylor:	Well that's fantastic to have you join us. One of the questions I had and I'd like to ask everyone this is, when you think about the future of humanity and the path that we're headed on based on your knowledge of what's going on in your field but just in general as well. Do you think that we're headed in a constructive direction or a destructive direction? Claire Madden:	I'm optimistic about humanity and about the future. I'm optimistic about this generation that we see emerging here. I think that each year has it's constructive elements and there are many great constructive parts in our culture and similarly there are an unhelpful or deconstructive parts that it would be better to reflect on and change so I think that the opportunities that we have in this generation and in this era are unmatched and they're extraordinary and the way the globe has become so connected has just opened up so much for our futures but like we were just talking about, I think if we also don't just always go with the flow but stop and think and reflect and say well what is it that would really help humanity here? Is it just more consumption of more hours of social media if there ... Is there actually something that we could bring into the conversation or get people thinking or what shape in whatever field we're in whether we'd be teachers or we're nurses or we're business people. What is it that can actually make a positive impact and if we all do that then we'll continue to see improvement in people's lives. Cal Taylor:	Yeah fantastic. Thank you so much, Claire Madden. Where can people, obviously you do a lot of speaking so you're available for speaking. You've got an amazing book out. Where can they find more details about you? We'll make sure there's links in the show notes but where's the best way for them to connect with you to find out more about either you speaking or your book or whatever? Cal Taylor:	Fantastic. Thank you so much for joining us. It's been an absolute pleasure chatting. Claire Madden:	Great to be with you. Cal Taylor:	Thanks for listening to the future of humanity podcast. To download the latest episode and find the transcript and various resources mentioned in today's episode, visit our website at foh.show that's foh as in future of humanity and show as in S-H-O-W. You can also [inaudible 00:37:03] our website, contact me with any feedback or suggestions for future episodes so please do reach out.